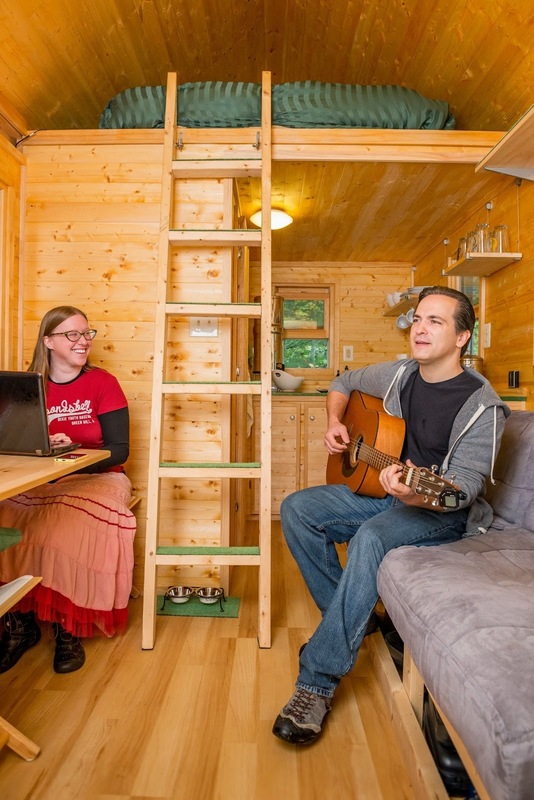 Writer Laura M. LaVoie and her husband first heard about tiny houses in 2008, when Jay Shafer appeared on The Oprah Winfrey Show. I live in Asheville, N.C. with my husband, Matt, and our hairless cat, Piglet. I am a freelance writer and I work from home. I love tiny homes, geek culture and craft beer. What made you become so passionate about tiny house living? I had no idea how much my life would change just because we simplified and downsized into a tiny space. Because we were able to reduce our expenses so much, I felt confident quitting my corporate job and writing full time. I was also surprised how much changing my life so drastically allowed me to make more connections within my community. Because of that, I like to share my story and help others transition into a tiny lifestyle. Tiny living can be a transformative journey of self-discovery, not just a new home. What are the advantages to living in a tiny house? For us, it is definitely financial. We saved to buy land and build the house, so we don’t owe a mortgage or rent. We also built off-grid systems so we don’t have high utility bills. This gives us the freedom to do more with our time and money. What are the biggest disadvantages? Our disadvantages are different from other tiny house dwellers. Because our home is on a foundation in the mountains, we are further from services such as hospitals and grocery stores. For now, this isn’t a problem; but as we age, we will need to consider other options. The good news is that our financial decisions now will make that possible. But that isn’t a universal experience for everyone in a tiny home. There are plenty of ways to incorporate everyone’s individual needs into their tiny home at whatever stage of life they get started. What considerations did you make when designing your house? We used a design from Jay Shafer’s original Tumbleweed Tiny House company before he left to start Four Lights. We didn’t make a lot of modifications. That being said, we could easily customize the house to our needs. We did make sure that our cat, Piglet, had a place for her litter box and a way to get up to the loft. Otherwise, the design is true to Jay Shafer’s original plans. It already included the two small closets, a small bathroom, the L-shaped kitchen, and loft. What modifications or changes have you made (or do you wish you could make) since living in the home? We have some ideas for Tiny House 2.0. We do want to add stairs and are trying to figure out how to re-engineer some of the other aspects of the house to make that possible. We also plan to install a rain catchment system. But we aren’t hurrying to do any of these remodels. The only thing I really wish I could have done differently was put the bumpouts in the roofline that are becoming popular now over the lofts. That would have given us more light and more elbow room up in the loft. The reason we didn’t was because we had never built anything, and a simple A-Line roof seemed much easier to start with. Now, we’re a little more comfortable with the building process, so we wouldn’t be so afraid to try it. What were the most challenging aspects of the construction process? For us, it was absolutely building the foundation. Since our tiny house is not on wheels, we used a post and pier foundation. We have eight concrete piers that we had to pour by hand. We did have a small cement mixer, but we had to carry all of the cement and the water to mix it up to the building site. Pouring concrete is dirty, grueling work and it went on much longer than we planned. It was absolutely awful. But once we got through that, we figured we could do anything. What have been the most useful resources when outfitting your tiny house? We’ve spent a lot of time thinking creatively about how to outfit the home. Many times, we simply searched for the smallest item available. A local futon store was great for buying our mattress. We bought a dorm-sized couch from a big box store. We’ve bought things from Ikea. It is also helpful to be able to look at things in a different way. For instance, we already had a set of director’s chairs that we thought would work well because they could fold up when we weren’t using them. But with the arms, they were too big for the space. So we removed the arms (and back) and made them into stools. Now, they’re perfect. On a more practical note, I would also suggest that anyone considering building their own tiny home start by practicing. Books and workshops are great, but at some point you have to put down the book and pick up the hammer. Try something small just to get the hang of things. It might be ugly, but you’ll learn – and it won’t be reflected in the construction of your home. Connect with Laura on Facebook. Start taking construction courses approved in your state. What’s Up with Self-Healing Concrete?